This story comes from a Fanzine called "The Beatles Yesterday and Today" from the February-June 1976 issue. I wasn't sure about posting this story because I knew it could be a bit "controversial." However, I think for the sake of Paul McCartney/Wings history it is good to read about what was happening through the eyes of fans that were there. So I do ask that you don't pass judgement in the comments section about the fans. In case the fans mentioned in the story are embarrassed in any way, I decided to change their names and I didn't post any of the photos that I have from this time that had a fan in the photo. My one regret was not keeping a diary of what I would consider the greatest five weeks of my life. There were so many special moments and I’m certain I’ll never be able to recapture them and especially the feelings that went along with them. I arrived in London January 21 and checked into my hotel, then tried to sleep a couple hours. All that went through my mind was to see Paul McCartney, so I went to Cavendish (his home). There seemed to be no life and I was rather afraid to be there alone, although I’d done it in 68, 69, 70 and 71. I walked over to EMI recording studios. There were 5 girls and I asked if they were there to see Paul. They nodded and showed me pix. Beena (an Indian girl) and Rita (who claimed to be from Liverpool) and I went to a liquor store and bought a bottle, then returned to EMI and proceeded to get high. During the evening, Linda left to tend to the kids and by then I was smashed and when she returned, I begged her to let me in to watch. I admit I became quite a nuisance. She was nice all the while. Later Allan Crowder (assistant manager to Paul) took me to the toilet. Next thing I knew, I was on Paul’s porch and the burglar alarm was ringing. The Bobbies came and roughed me up and I was crying. It was awful. Susan told me (days later) that Linda had come to see if I had left because she was rather afraid for Paul. I rarely went in the evenings, to avoid being a pest. Weekends they normally cancelled. Next time I had seen Paul was by accident. Usually they arrived at the studios between 2 and 3. I’d come to St. John’s Wood at 11:30 to look for a place to eat. Walked down Abbey Road twice. The 2nd time there was his purple mini and Paul and Linda starting up the stairs. I walked towards the car park and Linda saw me. I meekly said, “Can I take some pictures?” Certain they hadn’t heard me. Linda said, ‘that’s Cynthia,” and Paul put his hands in his pockets and remarked, “So this is Cynthia?” I felt a little like a legend and told him I felt embarrassed. He was so nice. 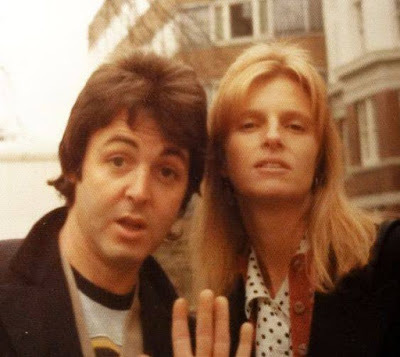 Linda said, “She’s apologized.” They posed for pix and I remember Linda directing me to take one from “over there.” Paul asked if I was on holiday and I said “yeah.” He asked if I liked it there and I said, “yeah” (what a conversation). I had said something like, “Haven’t been getting drunk.” Also told him I was going broke and he said, “already?” A girl came in the car park with a wild hairdo (It was Jojo) and Paul said, “don’t we look fancy today?” I had started, “could you sign..” by then Linda was up the stairs and Paul was to follow but stopped and said, “Sure.” All I had was a pic of Joan where she was hamming it up and handed it to him. He signed Paul McCartney and asked him to put “To Cynthia” on it. He told Linda, “Go on, I’ll be in in a minute.” She didn’t like it. While he was signing, I said, “If you turn it over, you’ll have a heart attack.” He did and looked a long time, saying it was lovely and who was it. Linda yelled, “It’s probably her husband.” (The word husband was emphasized). He had a tee shirt on, tan vest, navy blue trousers and navy blue coat. He carried a brown leather jacket. He went in and I walked down a few blocks. Ten minutes later, they were driving down the street and he waved to me. Couple hours later I went back to see them go in. They signed autographs and I asked to be in a pic with them. Linda said, “OK”, and I got in between them. She became upset and want to his other said saying, “I wanna be by the man, too.” He put his arm around me and it was beautiful. From here on in, I cannot remember days or any sort of sequences. Just happenings and some things he wore thanks to my photos. One day we met a guy who’d been an old friend of Pauls’ (worked with him on AHND). He talked quite a while with Paul so I got several pix that day. Linda constantly clutched Paul and commented, “Go Cynthia go” while I clicked away. She done that twice in the 5 weeks there. Another day, a creepy girl came by and when Paul pulled in the car park, she blocked his door so he could hardly get out. She asked to kiss him and he said, “You want me to get in trouble with my wife?” When they went up the steps, I said, “Oh, and I only had 3 pix left to take.” They turned around and smiled for me to get another few. 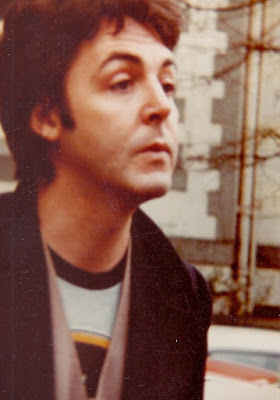 Paul almost always wore a long navy blue coat and long maroon scarf. Several days, he remarked about the weather. Once it was freezing and he said, “Good ole sunny Britain.” And another time it was pouring rain and he said, “Nice weather..for ducks.” There was a time Paul had the flu and hadn’t shown up for 5 days. We put get-well cards in his mail slot. When he came back to work, he thanked us for them. One night, I asked if he had a cough drop (as he had given some to my friends a few nights before) and he said, “No…I don’t.” Someone said we’d all had sore throats and he said he had tonsillitis. He said to me, “You should drink your orange juice.” That night I brought him some TUNES (English cough drops) and he started singing the commercial for it. A couple times Paul drove and when they reached the gates, Linda took over and Paul would go get the guard. Once he returned and I asked if I could have a special autograph. “Special?” he smiled and did one. 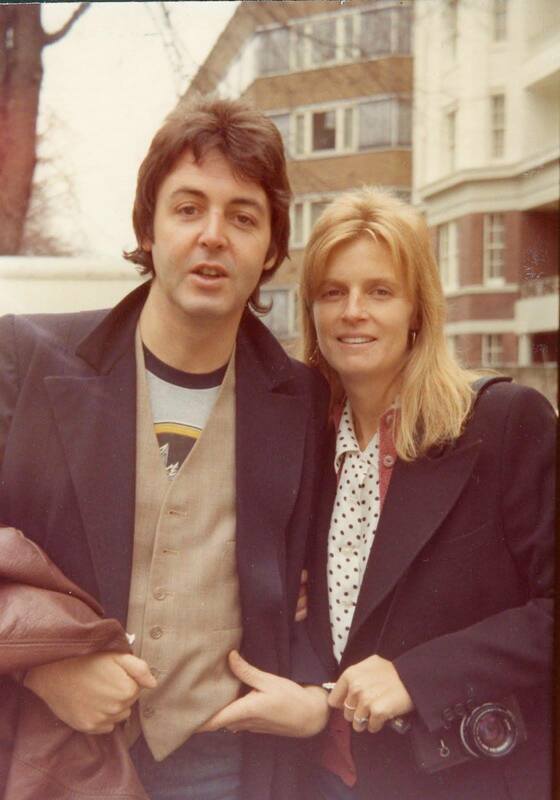 “To Cynthia, love Paul McCartney.” Sue was next to him and he posed for pic with her. Another time I asked to be in a pic with him and said, “ A quick one.” And Paul hammed it up. One day, Mrs. Mills (famous English pianist) was there and Paul kissed her in her car. He wore his cream-colored “BOYO” trousers, light blue shirt and beige jacket with an ARF pin. Once he did a cute dance and I missed it with my camera and asked him to do it again. He said, “You hafta be quick.” He didn’t it again, anyhow. A friend of mine sent me a John Lennon pix for Paul to sign (one she had taken since she hadn’t any of Paul). He started to, and then looked at it and because very angry. “Why should I sign it?” I tried to speak and he repeated, ‘Why should I sign it?” and turned his back, walking off. I felt like dying. I never expected a reply like that as I figured they were friends and everything was OK. I wrote a letter apologizing and explaining and he seemed nice again. Days later I had him sign one of himself that my friend dug up and he turned it over to make sure it was of him. Then he said, “Is this yours?” I said, “No, George took it. George Tebbens from Chicago. You know him.” He nodded and signed. Then looked up at me with those x-ray eyes that go right through you. “No, you thought I said ‘did you take it,’ but I meant was it your picture.” (I know it doesn’t make sense but we both kept on talking on different levels, neither of us understanding what the to her said. I’ve analyzed it and think it could possibly mean that since I tried to have him sign the pic of J.L. and then explained in the letter it wasn’t mine, that he was asking if THIS pic was mine.) Does that make sense? Nevermind. One evening I asked for an autograph. He and Linda had walked that night and he had dark glasses on and was a bit high. He said, “And who’s this for?” (Linda wanted to go in the car park right away, but he stopped to talk to us). One other thing I just remembered was that time I had Paul sign his pic and we had that ridiculous conversation…well, Linda drove the car in and almost hit me. He put his hand on my arm to move me out of the way and save me. (My hero). Okay, returning to “And who’s this for?” He looked up and said, “Oh, it’s for Cynthia..and what is your name little girl?” Linda remarked “Bonnie Bluebells.” One night we got tired of being a drag, so we rehearsed (4 of us) a dance routine. Linked arms and kicked our legs in the air and sang, “You gave me the answer.” We were right in the front of the door and he loved it. Linda looked bored. He clapped in rhythm and pointed dramatically to us, and said we were great. He said he was sorry he wasn’t holding auditions that night. Once a girl asked for a kiss on the autograph (you know, an X) and he thought she meant a physical one and he said, “I can’t” then she explained. One night I didn’t come and he told my friends, “See you tomorrow at Chinese Dentist.” They looked puzzled, and he said, “Chinese Dentist,” pointed to his teeth, “Tooth-Hurty” One thing I remember clearly is now Linda called me Cyn a lot and in the beginning seemed friendly. Towards the middle she just walked off and left Paul out there with us, and he felt very awkward. Just used to her hanging on him all of the time. She would walk up the stairs with a pissed look on her face, he he’d kind of glance around like he had to make an excuse to her or assure her he’d only be a minute. Once I was trying to take a pix and a pic signed. Linda was next to me and I shoved it to her and said, “Will you hold this?” She said, “Anything for you, Cyn.” Minutes later she said to Paul in an old lady’s voice, “Will you sign this for me?” He did. European tour: March 20 thru the end of March. Will hit Copenhagen, Berlin, Rotterdam and Paris. Some of the new lp will be done on the tour. New LP name: Speed o Sound. I have all of the titles but not with me and will wait for Paul to release them. Anyway, supposed to be a lot of mushy love songs. Joe and Denny and Jimmy get their own songs. U.S. tour: Starts March 31 to June 2. NY will be their last gig. 3 home bases: Chicago, Fort Worth and New Orleans. Linda is learning to drive and has her provisional license. Still, she drives without a licensed driver. Her new book will be released in October. Much more news but my mind is blank and some of it I’d rather not say. Anyway, hope you all enjoyed this bit of unorganized ___________. Once, again, I want to thank Paul for being so loveable and making this trip the greatest event of my life. Once, I dropped my mittens and Paul pointed and said, “Who’s are these?” I said, “Mine, that’s ok, leave them there.” But he bend and picked them up for me saying, “Someone’s lost their boots” and handed them to me. Also, once he pulled up, got out to open the gates and said, “and who are you waiting for?” I teased, “Gary Glitter,” He said “Really? Is he recording today?” “Naw…” I felt stupid. All these snippets of eyewitnesses would make a good collage of pop history anthologized in a book. Sara - don't worry about "controversial" because a lot of crazy behavior went on with the fans, Paul being nice/flirty/silly or nasty and Linda being sullen/bitchy. It broke my heart when Paul was really high and also when he would just ignore us after waiting hours to see him with Linda always pulling his arm. It was what it was in retrospect and am now content that I had met him all those years ago. It's amusing to me when I read of fans of the eary 70's/late 60's talk about how "clingy" and "bitchy" Linda was in stories where the fans are bugging them over and over and over again. In this girl's own story, Paul and Linda posed for countless photos for her, Paul gave her half a dozen autographs and Paul and Linda stopped and chatted (either together or separately) a bunch of times. But the fan has to focus on the times when they were rushing somewhere and oh, poor Paul would totally have talked to her more if evil Linda hadn't been rushing him. And this was AFTER this girl made a nuisance of herself by getting drunk and making a scene (which for most people would have resulted in her being chucked off the property permanently). The lack of self-awareness of how crazy these fans acted is astounding.